Free Shipping Included! 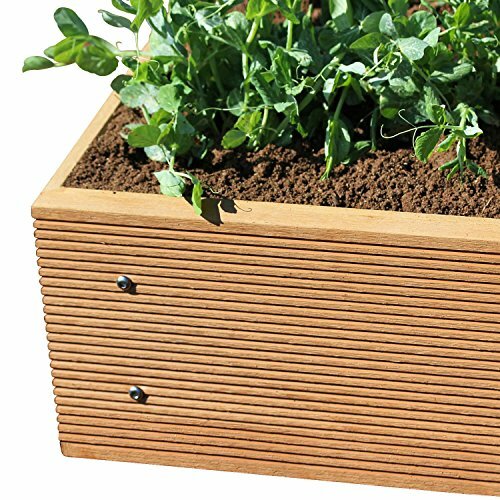 ECOgardener Premium Raised Bed Garden Planter Box 2' x 4' – The most beautiful elevated planter that will not crack, split, warp or break. Easy setup and maintenance free design. by ECOgardener at Tulips Orchids. MPN: 4336473302. Hurry! Limited time offer. Offer valid only while supplies last. THE MOST BEAUTIFUL RAISED BED - Build a garden that you can be proud of and say goodbye to cheap alternatives that splinter, warp, crack and dry out. The PREMIUM QUALITY and aesthetic beauty of this raised bed will complement any setting. ECO-FRIENDLY - Our composite boards are made from 95% recycled materials, so you can be confident you are doing your bit for the environment. MAINTENANCE FREE - No specialist cleaning or painting required to ensure you get the most out of your raised bed. With a 10+ year lifetime you will be enjoying produce from your garden for years to come. EASY ASSEMBLY - Can be assembled in five minutes by just about anyone. No need for any specialist tools or equipment, everything you need comes in the box. FULL 10" DEPTH - Beware of raised beds that are so shallow that you cant actually grow anything. Our 10" Depth ensures that you have enough depth to grow most plants. Still not enough? Our Raised beds can be easily stacked so you can grow anything. If you have any questions about this product by ECOgardener, contact us by completing and submitting the form below. If you are looking for a specif part number, please include it with your message.